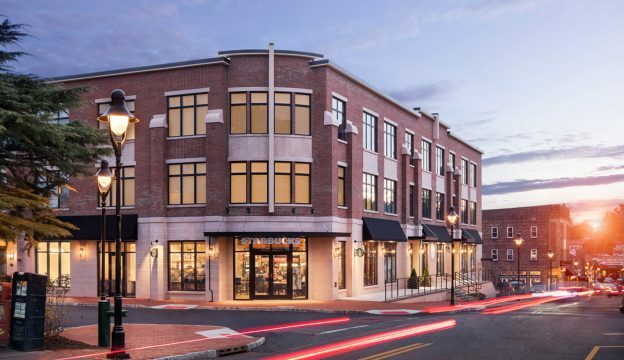 CLARUS Maplewood is a new three-story boutique building that features twenty modern one- and two- bedroom luxury apartments with spacious floor plans, ample light and contemporary kitchens. Located in the heart of Maplewood Village, adjacent to the Maplewood train station, it provides residents convenient access to mass transit and an easy commute to NYC. Street-level retail including a Starbucks and BCB Community Bank provides desirable services for residents and commuters, and activates the downtown streetscape. In addition, the building features hotel-inspired amenities including a luxe lobby and residential lounge, a cutting-edge fitness center, and residential parking garage. JMF has developed CLARUS with a pioneering approach to a healthier way of living. As a landmark WELL Multifamily Residential Certified Building, the property features sustainable design elements and superior air and water quality. WELL is a Performance Based System for measuring, certifying and monitoring features of the built environment that impacts human health and wellness through air, water, nourishment, light fitness, comfort and mind. This entry was posted in Low Rise, Multifamily/Residential, Sustainable Design, Transit Oriented on January 25, 2018 by Melissa Thomson.